We have clear ideas about the direction in which we want to develop the GRANSHAN competition. Among other things, this involves changing the judging system and opening it up from type design to typography. At the same time, it has become clear that an annual competition does not synchronize well with the development cycles of non-Latin scripts, which often span more than one script and take considerable time to develop. We are therefore considering to run the competition only every second or even third year. In any case, we will pause the competition in 2018, and use the hiatus to refine and consolidate these far-reaching considerations. At the end of the GRANSHAN Conference in Yerevan we were very enthusiastic about the prospect of holding the next conference in Silicon Valley in 2018. Accordingly, we have announced online the dates and an approximate program. In the last few months a lot of hard work went into the event, including a commitment by the San José State University to provide us the venue and operating staff free of charge. However, too many important aspects have remained open to this day, due to a range of challenging complementary circumstances. This means that we cannot organize the conference as planned in 2018. Fortunately, however, we will be able to host the GRANSHAN Armenian Script and Culture Days at Glendale/Los Angeles on July 22 and 23. A big thank you to the generous sponsors and the organizing team around Angela Poghosova! We will use the next few weeks and months to consider from the ground up the future manifestations of the GRANSHAN project, beyond the competition. This will include responding to the considerable growth in relevant international conferences since 2007, and the increased focus of the entire industry on non-Latin scripts – in some part, we expect, due to GRANSHAN itself. And in addition to the valuable encounters and inspirational exchanges at conferences, it is clear that education and training is becoming increasingly important, especially in times of digitization and globalization. Integrating these aspects into GRANSHAN as a fundamental attitude will take some work. 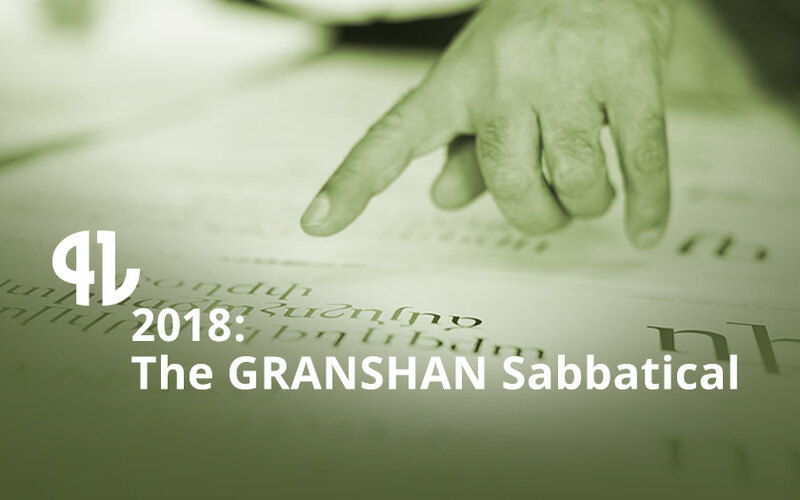 GRANSHAN will be taking a sabbatical in 2018 to reflect on the future of non-Latin communication, and we welcome the contribution of anyone interested in working on these topics. We would like to thank for their great ideas, supporters and members, especially the organization team of the GRANSHAN Conference in San José, Chang Sik Kim, Gerry Leonidas and Kathrin Schäfer – and the entire GRANSHAN Foundation Team. We would also want to extend our thanks to the members of the jury of the GRANSHAN competition and especially Susanne Zippel, who is hard working on redesigning the competition. Lastly, to Khajag Apelian and Ilya Rudermann, whose ideas for workshops in San José provide us with a germ for a possibly quite different GRANSHAN event in the future.